So what were the top songs in the Eurovision Top 250 countdown – Read the full list here. 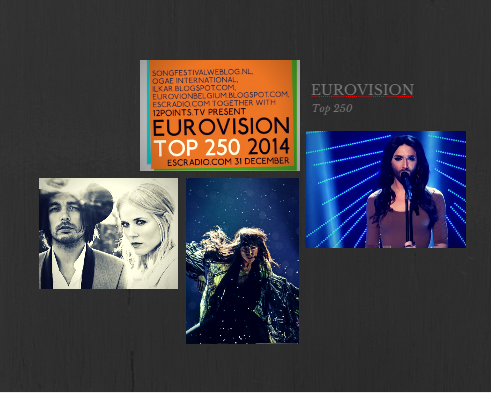 You voted for your favourite Eurovision songs in the Annual countdown brought to you by 12 Points.tv and ESC Radio. So who made the chart? So there you have it for this year. Loreen holds on to her #1 spot for another year but Conchita Wurst and The Common Linnets make a big impact on the chart. Who will be #1 next year? Only one of my choices didn’t make it into the Top 250 – interesting how some songs stayed at exactly the same position and how some classics made big moves up the charts, Anne-Marie David in particular. Was it all due to her support of Axel from Belgium and increased visibility amongst the Eurovision fans?